Sometimes you can’t go home again. Unfortunately, this is the case with Cote St. Jacques. We had not been in years [about 15]. We were interested to see what had gone on here because they originally had 3 stars when we visited, then lost one star and now are back to 3 stars. There used to be a tunnel under the road connecting the then main building and restaurant with the rooms overlooking the river. Now there is a fancy spa and the restaurant is over on the room side. The rooms are a lovely as ever with a beautiful view of the Yonne River. No. 21 our favorite from the past is large and very comfortable. We were shown to the lounge for our coupe de champagne and amuses. This is a good system in France where you order food and wine while having an apertif. It gives them time to get your meal organized. Sometimes it doesn’t work out so well…read on. 2. quail egg [hard boiled] with [not sure? ]sometimes the servers rattle things off too fast and we miss it. 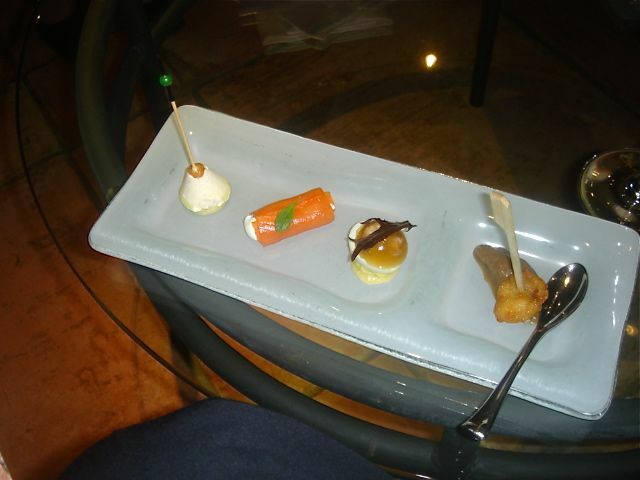 3. smoked salmon stuffed with a small shrimp [crevette grise] mousse. 4. a triangular shape mound of cream of Roquefort. Some of these descriptions leave a lot to be desired. The service was quick and perfunctory. It only got worse. The usual procedure is to order both your menu and wine in the lounge. We ordered our menu, but no sommelier showed up. We finally asked to be escorted to our table. Then we waited! No sommelier, no wine list for at least 10 minutes. Finally a wine list and another 15 minute wait to place our wine order. Then another 15 minute wait to finally get the wine to the table. 45 minutes of nothing – no food, no wine, no nothing. Everything was ordered 1 for 2. The a la carte portions that we saw on other tables were huge with huge euro price tags. 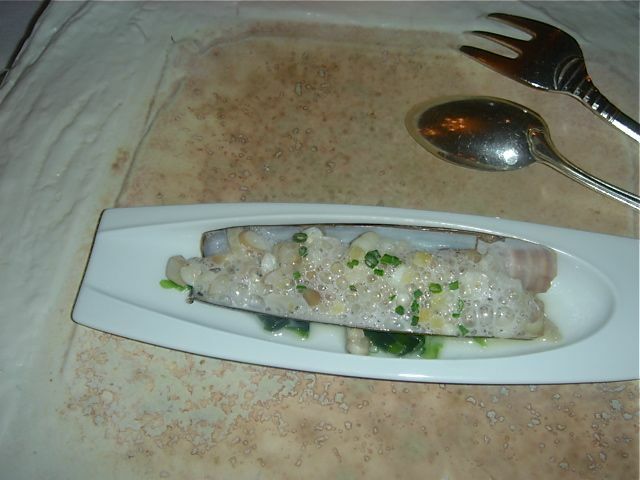 Coquillage-razor clams—tiny pieces of razor clams [about 1/8” slices] done in a sea foam broth with bits of chives. Excellent! 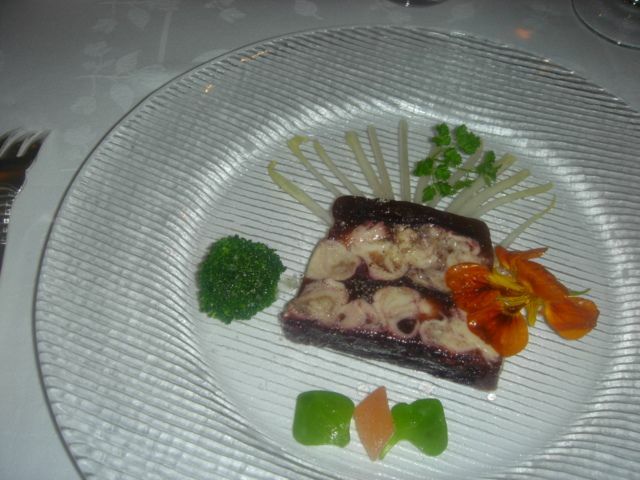 Oyster terrine encased in a shallot red wine gelee, served with julienne of endive, broccoli flower with a touch of fleur de sel and chicory. I thought the gelee was a bit too hardened into a crust on the edges and “fought” with the oysters. John liked this dish more than I did. 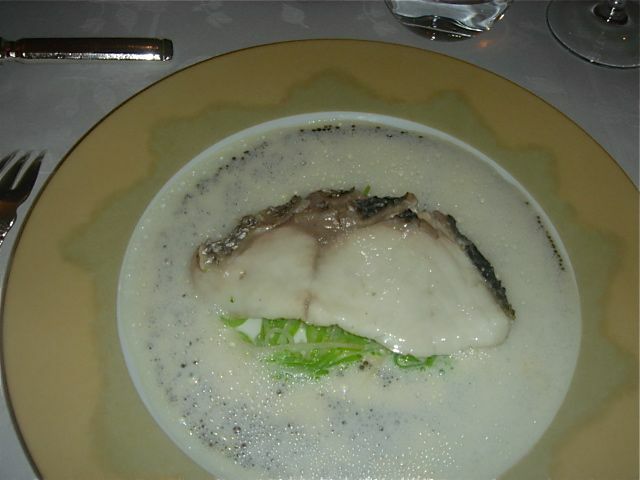 Lightly smoked sea bass with oscetra caviar crème sauce—this is a Cote St. Jacques classic. It shows its age—very rich, very dated. It should be retired to the great recipe book in the sky. Classics like Oysters and Pearls [French Laundry], Arpege Egg, Bra’s Gargouillou, Marcon’s lentil ragout, Jean George’s Foie Gras Brulee deserve to be long- lasting, but the sea bass at Cote St. Jacques doesn’t make the cut in 2008. Quail egg in Uni shells. 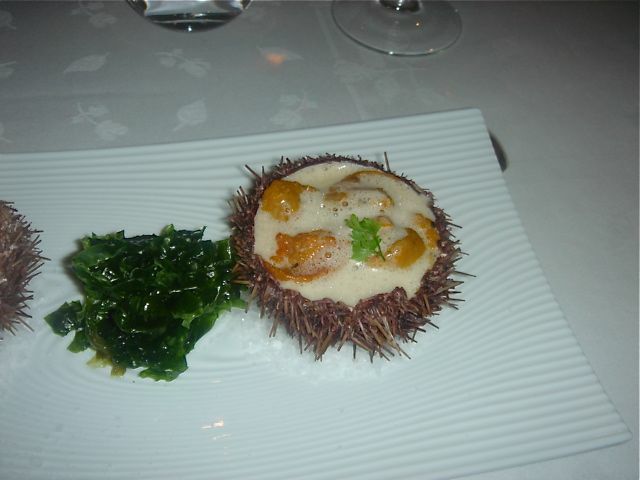 The uni was from the Atlantic, the quail eggs were either poached or lightly boiled. The yolk was runny [no help with description from the server, this was “dump and run” 3 star service] and there was some type of foam [mystery foam]. The dish was quite delicious. Hereford Beef Ribsteak with Macaroni with foie gras and truffle stuffing, confit of baby turnips. 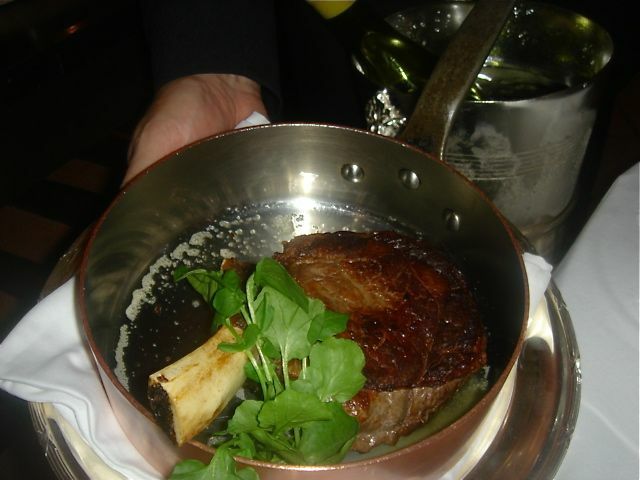 The beef was presented whole in the pan and returned to the kitchen for plating. The biggest disappointment was the macaroni. 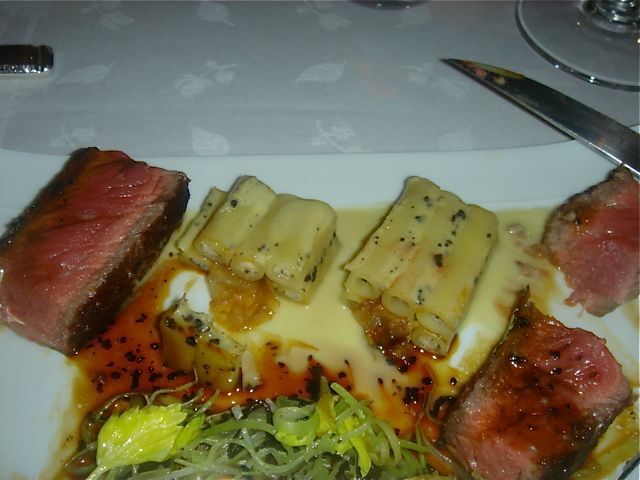 We had visions of L’Ambroisie’s macaroni that stand like little soldiers on the plate. Cote St. Jacque presented a gluey mess of congealed noodles with zero taste of truffles and the foie was “missing in action”. The beef itself was good. The red wine reduction a classic done well. Looking at our photo of the dish the baby turnips don’t seem to be apparent, but I could be wrong. There is a mound of some sort of veggies. . The service was so horrible and perfunctory that we could have been eating at a truck stop. 2002 Chablis Chappelot, Raveneau—classic flavor, bright, flinty, excellent finish. A good companion to the early dishes. 2006 Bertange Vougeot Le Village—not real big, but enjoyable. It is really hard picking at these exchange rates. A 50 Euro bottle is $ 80.00—bad news!!! 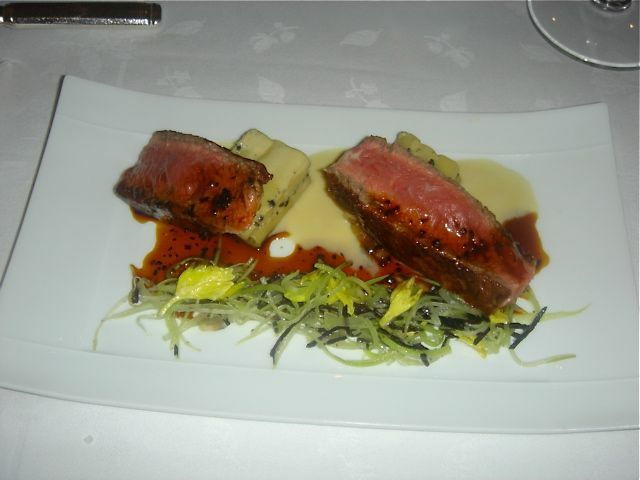 Our rating was that Cote St. Jacques should have remained a 2 star or been reduced to a 1 star. A very over priced, badly presented meal with a few good tastes, but not even in the same world with the 3 stars we had just experienced in Paris. Listing the “truck stop” with Arpege, Guy Savoy or Ledoyen is neither right nor fair to the diner who is relying on Michelin for guidance.